Many people get worried when they notice white bumps or spots on lips in case it’s a sign of a more serious health condition. 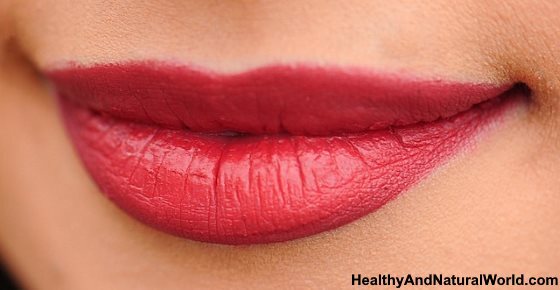 There are many reasons why white spots or dots appear on the lips, and fortunately, most of them are harmless. Some harmless types of white lip bumps are Fordyce spots, canker sores, milia spots, and even acne pimples can appear on lip line. However, a hard white spot that doesn’t go away may require you to have it checked out by a doctor. The white lip bumps or spots can appear on the upper or lower lip, or both at the same time. For example, some spots appear as painless tiny white granules and are visible when the lips are stretched. Other bumps can resemble a white ulcer on the corner of the lips and be uncomfortable when eating. Having white pimple like bumps on your lips can make you very self-conscious. After all, a large white spot on red lips will be very noticeable and you probably want to get rid of it as fast as possible. Another reason to cure white spots on your lips is that they may cause pain and discomfort when you open your mouth. In this article, I will look at the many causes of white bumps appearing on or around the lips. You will also find many helpful natural treatments that are effective in treating these white spots on your lips. Canker sores are very common and they are one reason for having white bumps or white spots on lips. These bumps can appear on the inside of your upper or lower lip. You can recognize a canker sore because it will have a white center and red edge. A canker sore usually starts out as a tiny white spot on your lip and gradually becomes larger. Sometimes, you may develop a large cluster of sores on your lips which can be very painful. To make a natural remedy for canker sores with witch hazel, mix 1 tsp. witch hazel in a cup of warm water and add 1-2 drops of clove oil. Mix well and swish this around your mouth for a few minutes, making sure that the remedy gets to the canker sores. Repeat using the hitch hazel mouthwash 2-3 times a day to help speed up the healing process of the white lip bumps. To make a soothing baking soda paste for canker sores, all you have to do is mix one tbsp. salt, one tbsp. baking soda and 4 oz. water. Apply the baking soda remedy by dabbing the paste directly onto the white ulcer on your lip for a soothing relief. Baking soda on canker sores helps to relieve the pain and irritation and reduce the size of the white lip bump. You can also use your used tea bags to help canker sores heal quicker. Tea also contains astringent properties and the tea bags make a great a natural compress so that it’s easier to apply tea to the sore white lip bump to soothe the pain. If you have other types of sores in your mouth, then you may find useful information and home remedies in my article about the possible causes of sores on the roof of your mouth. 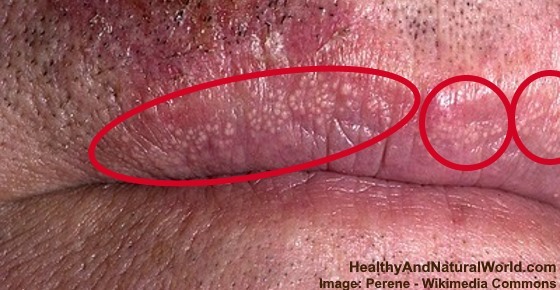 Cold sores on and around your lips are caused by the herpes simplex virus (HSV-1). The herpes simplex virus (HSV-1) is very contagious and the infection can be easily spread from your lips to your nose, and even to the roof of your mouth. Although there is no cure for the cold sore virus, there are many natural remedies that work to treat cold sore symptoms on your lip. For example, raw honey, tea tree oil, vitamin C, and Lysine are all natural ingredients that help to treat painful symptoms of cold sores. Fordyce spots are harmless tiny white bumps that look like raised dots under the skin of your lips. These little white lip spots are more visible when you stretch your lips, however, some people have large clusters of spots in and around their lips that are very visible. The only way to get rid of Fordyce spots is by laser treatment. Generally, dermatologists recommend leaving the spots alone and you should never try to pick or squeeze the spots. A white bump around the edges of your lip could be an acne papule or spot. Outbreaks of acne spots around the lips appear when the skin pores become blocked by sebum (the oil the skin produces) and dead skin cells. Bacteria then infect the blocked pore and a spot with a white head develops. Use tea tree oil as a spot treatment to quickly get rid of an infected white bump around your lip. Tea tree oil can be used directly on the skin for a very small area (for example, on a spot). Put a drop or two of tea tree oil on the end of a cotton swab, dab it on the white lip bump to kill the infection. Repeat applying tea tree oil a few times a day until the redness and swelling have disappeared from the lip bump. Did you know that there are more ways to get rid of pimples? To find out more information, please read my article on 12 of the best natural ways to remove pimples. If your lips and the area around the mouth are sore, cracked and red, it could be a sign that you have oral thrush. Oral thrush also causes white bumps or spots to appear on your throat, tongue, and around your lips. These white spots around the mouth can be treated naturally using apple cider vinegar because of its antifungal properties. To prevent outbreaks of thrush, Dr. Khatri recommends using good dental hygiene practices, limiting foods that contain sugar or yeast and taking care of your health. To use apple cider vinegar as a natural cure for Candida fungus, mix equal amounts of raw unprocessed ACV with water. Soak a cotton ball in the mixture and apply the compress to the affected areas to destroy the fungal infection and get rid of the white bumps around the mouth and lips. Keep the compress on for 10-15 minutes before rinsing off with warm water. Use the oral thrush remedy 2-3 times a day until the symptoms have gone completely and the white bumps on lips disappeared. Small white bumps around the edge of your lips could be harmless milia spots. These little raised white dots on the skin appear when keratin forms a tiny cyst just under the surface of the skin. Milia spots commonly appear as white bumps on the eyelids and around the eyes. On rare occasions, a hard white bump on your lip could be a symptom of a more serious condition like lip or oral cancer. To get the best treatment for any type of cancer, you should be aware of cancer symptoms because early diagnosis is essential. Therefore if you have a bump on your lip, gums, or inside your mouth that doesn’t go away, you should see your doctor as soon as possible. Hi Carole, you may refer to angular Cheilitis. Have a look at my article “How to Treat Angular Cheilitis (Cracked Corners of the Mouth)” which has information also about the causes.